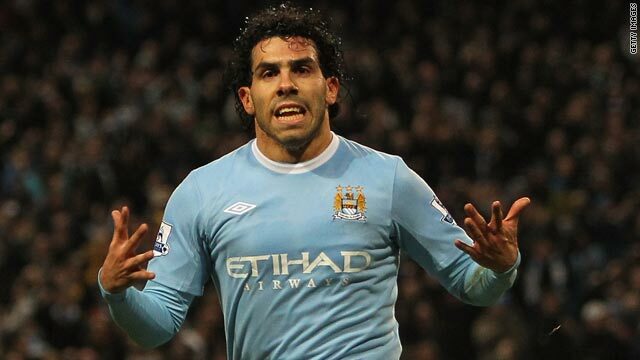 Carlos Tevez ran towards the Manchester United bench after putting City ahead in the League Cup semifinal. (CNN) -- Carlos Tevez scored twice against his former club as Manchester City claimed a 2-1 derby triumph over bitter rivals Manchester United in the first leg of the English League Cup semifinal on Tuesday night. The Argentina forward, who left United in acrimonious circumstances after rejecting a new contract at the end of last season, scored in either half to give new manager Roberto Mancini victory over Alex Ferguson in his first derby in charge. Veteran midfielder Ryan Giggs put United ahead in the 17th minute at City's Eastlands Stadium with his first goal in a Manchester derby since 1996, but Tevez leveled from the penalty spot three minutes before halftime and headed the winner in the 65th minute. Mancini took off the man of the match with just over 10 minutes to play, and City had to hold on as United surged forward in search of a second away goal ahead of the second leg at Old Trafford on Wednesday next week. Ferguson field an almost full-strength team for the first time this season in the tournament, which offers a Europa League place for the winners, but the continued absence of injured first-choice central defenders Rio Ferdinand and Nemanja Vidic was apparent in both City goals. Fullback Rafael da Silva was ruled to have twice pulled back Craig Bellamy, the second time inside the area and with seemingly little contact made, as the City striker took advantage of his young opponent's lack of experience. Tevez blasted the ball into the net for his 12th goal in 11 games despite gamesmanship from his former teammates Wayne Rooney and goalkeeper Edwin Van der Sar, who was booked for delaying the spot-kick. Wes Brown and Jonny Evans were then caught out of position as United failed to properly clear a corner, allowing Tevez to dive in with a predatory close-range header from Vincent Kompany's clever hooked cross. Mancini, who left Brazil star Robinho on the bench after putting him on and then taking him off again during Saturday's defeat by Everton, also had an inexperienced defensive line-up as he started with Dedryck Boyata. The 18-year-old Belgian made only his third first-team appearance for City, and could do nothing as goalkeeper Shay Given's reflex save from Rooney's close-range flick hit his arm and fell into the path of Giggs, who made no mistake to put United ahead. Boyata then got in the way of a goal-bound header from central defensive partner Micah Richards later in the first half, and looked a distraught figure when he was finally substituted in the 77th minute. His replacement Nedum Onuoha made a vital contribution as United peppered the City goal, clearing United substitute Michael Owen's scuffed shot off the line with Given grounded after doing well to deny Rooney. Given tipped over another Rooney effort after the England striker jinked into the penalty area with ease, and winger Antonio Valencia should have put Patrice Evra's cross into the net in the 87th minute as he appeared to be distracted by a potential collision with a goalpost -- though replays suggested he was offside anyway. In time added on, Given again got down well to gather a Rooney shot which looked destined to hit the woodwork as City held on for a famous win. Aston Villa take a 1-0 lead into the home second leg of their semifinal against Blackburn this Wednesday.